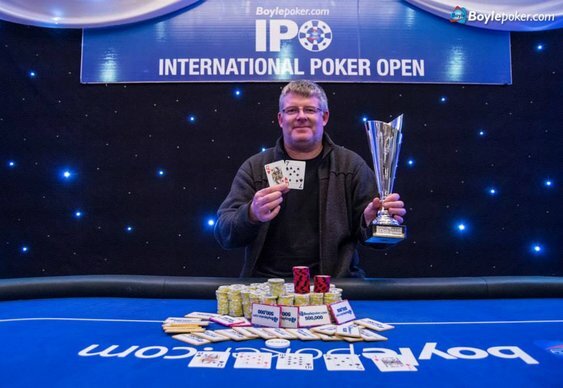 Chris Pyke became the Boylepoker IPO champion and €46,211 richer on Monday night after pushing his way past Paudie Cusack heads-up. The main event in Dublin welcomed 1,656 grinders in total, but by the time the final table rolled around last night it was Victor De Rijke leading the way. With more than 26 million chips it looked as though Rijke would run away with the title, but as the chips began to fly it was Pyke who moved into fifth gear. After working his way into the final five, the canny Irishman managed to negotiate a deal that saw him bank the lion's share of the prizepool. With everyone happy with the money they'd won, Joe Ward, De Rijke and Richard O'Neill eventually hit the rail to leave Pyke and Cusack heads-up. Despite agreeing to play on normally, the prizepool had already been split which meant Pyke and Cusack weren't afraid to commit their stacks. After a flurry of bets and cards, it was Pyke's Qh 7s that clinched the pot and the IPO Dublin title ahead of his opponent's Js 6s.